Una inusual ruina descubierta en las montañas de Perú podría dar nuevas pistas sobre la historia de los habitantes de la cultura Chachapoyas, conocidos como los "guerreros de las nubes" que se enfrentaron al imperio Inca antes de la conquista española. Keith Muscutt, un británico experto e investigador de la Universidad de California Santa Cruz, dijo este miércoles que el lugar era "notablemente anómalo" por su tamaño, forma y remota ubicación en la densa selva, repleta de monos araña, tucanes y otros animales. La no fortificada y posiblemente ceremonial estructura está localizada en un área antes considerada la periferia del dominio Chachapoyas, en la región del alto Amazonas. "Lo que está mostrando es que no sabemos realmente cuál fue su territorio", dijo a Reuters. 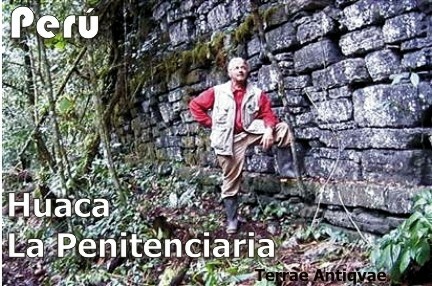 El lugar donde las ruinas fueron descubiertas es considerado una zona que separa las montañas de Chachapoyas de las culturas de la cuenca del Amazonas. "Ciertamente no es una fortaleza, entonces, el territorio Chachapoyas se extendió más allá hacia el este o ellos confiaron más en la cooperación que en el conflicto con sus vecinos", dijo. La civilización Chachapoyas, que floreció entre los años 800 y 1475, es conocida por sus ciudadelas ubicadas en lo alto de las montañas como Kuelap o Vira Vira, con momias muy bien conservadas encontradas en tumbas en el Lago de los Cóndores. Doblegados por los Incas justo antes de la conquista española, los Chachapoyas se aliaron con los europeos después de 1532, pero finalmente cayeron víctimas de enfermedades traídas del viejo continente y desaparecieron. Esta ruina, llamada Huaca la Penitenciaria, consiste en una gran y sólida plataforma ceremonial, una plaza y un número de construcciones rectangulares y circulares. El lugar, lleno de vegetación, fue descubierto por la familia peruana de exploradores Añazco en una meseta en las montañas entre Río Verde y Río Huabayacu, en el departamento de San Martín, a unos 900 kilómetros al norte de Lima. En agosto pasado, Muscutt, de 60 años, tomó parte en la expedición liderada por los Añazco, que hizo un reconocimiento preliminar del lugar. "Mi meta en este punto es notificar a las autoridades peruanas apropiadas", dijo Muscutt, quien está hablando con arqueólogos para evaluar el descubrimiento. Pese a que se necesita una investigación adicional para confirmar que es una estructura Chachapoyas, Muscutt dijo que tenía un friso ornamental y una albañilería típicos de esa cultura. "También todas las paredes tienen un leve bulto como el costado de un barril, que creo que es una falla en su ingeniería que ellos adoptaron e hicieron un rasgo, una opción estética", dijo Muscutt. La ciudad fue abandonada por lo menos hace 400 años. "Es una muy interesante cápsula arqueológica del tiempo", agregó. LIMA, Perú - An unusual archaeological site discovered in Perus mountains may hold clues to the history of the Chachapoya people, known as cloud warriors, who fought the Inca Empire before the Spanish conquest. Keith Muscutt, a British-born Chachapoya researcher with the University of California at Santa Cruz, said Wednesday that structures found at the site were strikingly anomalous because of their size, shape and remote location in the dense forest full of spider monkeys and toucans. The unfortified, possibly ceremonial structures are located in an area previously considered on the periphery of the Chachapoya domain in the upper Amazon region. What it is showing is that we dont really know what their territory was, he told Reuters. The place where the ruins were discovered had been considered a buffer zone between the highland Chachapoya and the tribal cultures of the Amazon basin. It is certainly not a fortress, so either the Chachapoyas territory extended further east, or they relied more on cooperation than conflict with their neighbors, he said. The Chachapoya civilization, which flourished between 800 and 1475, is known for its mountaintop citadels, such as Kuelpa and Vira Vira, and its well-preserved mummies found in tombs at the Lake of the Condors. Conquered by the Incas just before the Spanish conquest, they allied with the Spaniards after 1532, but fell victim to diseases brought from Europe and vanished. This ruin, dubbed Huaca la Penitenciaria (Penitentiary Ruin), consists of a large ceremonial platform, a plaza and a number of rectangular and circular buildings. The heavily overgrown site was discovered by the Anazco family of Peruvian explorers at a plateau in the mountains between the Rio Verde and Rio Huabayacu in the Department of San Martin, about 560 miles (900 kilometers) north of Lima. In August, Muscutt, 60, took part in an Anazco-led expedition that made a preliminary survey of the site. My goal at this point is to notify the appropriate Peruvian authorities, Muscutt said. He is also talking to archaeologists to evaluate the find. Although additional research is needed to confirm that it is a Chachapoya structure, Muscutt said it had an ornamental frieze and dry masonry very typical of the Chachapoyas. Also, all the walls have a slight bulge to them like the side of a barrel, which I think is a fault in their engineering that they adopted and made a feature  an aesthetic choice resulted from engineering accident, Muscutt said. He said the site had been abandoned for at least 400 years. It is a very interesting archaeological time capsule, he said. Silver Spring, Md. -- Explorer Keith Muscutt has announced the existence of a previously unknown pre-Columbian ruin in Peru: the Huaca La Penitenciaría de la Meseta, which will be featured in Discovery Channels new series, CHASING MUMMIES, premiering January 2008. 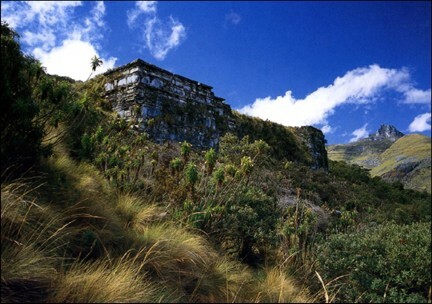 Located in the cloud-forested eastern slope of the Andes mountains, the ruin is believed to belong to the ancient Chachapoya -- a civilization that flourished in the upper Amazon, between its Huallaga and the Marañón tributaries, from about the ninth to the fifteenth century AD. Muscutt delivered the news at the annual Institute for Andean Studies conference (http://www.instituteofandeanstudies.org) at the University of California, Berkeley. The Chachapoya are renowned for their mountain-top citadels, such as Kuelap, Gran Pajatén and Vira Vira, and for well-preserved mummies recovered from cliff tombs at the Lake of the Condors and Lake Huayabamba. The ruin, consisting of a ceremonial platform (approximately 100 ft. x 200 ft. x 24 ft.) overlooking a plaza (approximately 200 ft. x 300 ft.), as well as numerous rectangular and circular buildings, is of particular interest because of its unprecedented form, size, and the remoteness of the area in which it was found. First discovered by local pioneers, Octavio, Merlin and Edison Añazco, the site was nicknamed the "Huaca La Penitenciaría" (Penitenciary Ruin) because of its impregnable appearance. News of their discovery was relayed by them to Muscutt who, guided by the Añazcos, arrived at the site and made a preliminary survey of it in August of 2006. "This is an exciting development for Chachapoya archaeology. The main building is a stepped, rectangular structure made up of three tiers. This building is about two-hundred feet long, a hundred feet wide, twenty-four feet high, and oriented to the cardinal points of the compass. As far as I can tell, apart from some drainage shafts, its completely solid. I imagine it served as a ceremonial platform -- a stage for Chachapoya rituals," said Muscutt. Discovery Communications, Inc. is the leading global real-world media company. Discovery has grown from its core property, the Discovery Channel, first launched in the United States in 1985, to current global operations in 170 countries and territories with nearly 1.4 billion cumulative subscribers. DCIs over 100 networks of distinctive programming represent 27 network entertainment brands including TLC, Animal Planet, Travel Channel, Discovery Health Channel, Discovery Kids, Discovery Times Channel, The Science Channel, Military Channel, Discovery Home Channel, Discovery en Español, Discovery Kids en Español, Discovery HD Theater, FitTV, Discovery Travel & Living (Viajar y Vivir), Discovery Home & Health and Discovery Real Time. DCIs other properties consist of Discovery Education and Discovery Commerce, which operates more than 100 Discovery Channel Stores in the U.S. DCI also distributes BBC America in the United States. DCIs ownership consists of four shareholders: Discovery Holding Company (NASDAQ: DISCA, DISCB), Cox Communications, Inc., Advance/Newhouse Communications and John S. Hendricks, the Companys Founder and Chairman. Discoverers: Octavio, Merlin and Edison Añazco, descendents of the pioneer Benigno Añazco, who first reached and settled La Meseta in the 1980s. Members of the August 2006 Expedition: Eyner Añazco, Robinson Añazco, Patrocino Añazco, Clever Añazco, Alan Añazco, Merlin Añazco, Edison Añazco, Cheyver Garrido, Keith Muscutt. Location: La Meseta, a plateau in otherwise mountainous territory, between the Río Verde (also known as Río Chilchos) and Río Huabayacu, both tributaries of the Río Huallabamba, in the Department of San Martín, Peru; approximately 7 degrees South of the Equator, and 77 degrees and 30 minutes West of Greenwich. The village of La Morada, an annex of Chuquibamba, Chachapoyas, Amazonas, is two days on foot or by mule from La Meseta. Muscutt comments on the structure and design: "It supports the foundations of several rectangular and circular buildings  presumably religious buildings or elite residences. An extension adds another thirty by sixty feet to the main building, making it L-shaped. This has the remains of what might have been a look-out tower on it. Projecting horizontally from the main building, starting about half way up it, is an elevated masonry platform, apparently a plaza, two hundred feet wide, and three-hundred feet long -- roughly the shape and size of a football field. A seam between the main building and the plaza indicates that they were built at different times." "The plaza has tumbled structures on it too, although these look somewhat improvised, so I wonder if they were part of the original design. After centuries of overgrowth as well as damage from frequent earth tremors (the area was hit by a 7.5 Richter-scale earthquake as recently as 2005) its hard to trace the outlines of these buildings. At the far end of the plaza, the ground rises up to the level of its surface, and it gradually transforms into a maze of low stone walls that look like the results of clearing land for agriculture. Overlooking the plaza, the upper facade of the main building incorporates a typical Chachapoya frieze consisting of two parallel rows of recessed masonry, so theres no doubt in my mind that this is Chachapoya handiwork; but without the architectural detail I wouldnt be sure what culture to attribute it to. Theres only one Chachapoya building that even remotely resembles it. Thats Pirca Pirca, near Chivani, above tree line at around 11,000 feet  a far cry from La Penitenciaría, which is 6,000 feet above sea level, with spider monkeys in the forest canopy. Other than Pirca Pirca, and now La Penitenciaría, almost all known Chachapoya buildings are round or curvilinear. With the exception of the colossal retaining wall of the Chachapoya citadel, Kuelap, I cant think of a Chachapoya engineering project as ambitious as La Penitenciaría. Over 25,000 cubic yards of dressed stone and rubble were needed to build it." "Its totally unexpected that such a massive monument would show up on the periphery of Chachapoya territory, in an area that has usually been thought of as a buffer zone between the highland Chachapoya and the tribal cultures of the Amazon Basin. But La Penitenciaría was definitely not a fortress -- so either their territory extended further East, or the Chachapoya relied more on cooperation than conflict with their neighbors. Compounding the puzzle, there dont seem to be any other buildings in the immediate vicinity. Unlike most ceremonial platforms in the Americas, it doesnt seem to be the nucleus of a population center. It just sits there in the middle, or the edge, of nowhere. Like London Bridge in Arizona  its really there, but very hard to fathom. Someone put a tremendous amount of energy into Huaca La Penitenciaría de la Mesetas construction, but exactly who, why, and when is anybodys guess. 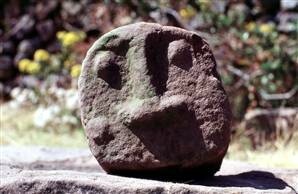 My own guess is that it had something to do with ancient coca leaf production at La Meseta. But for the time being its an architectural and archeological enigma -- one that promises to open a new chapter in the history of the Chachapoya." Elevation: 2,000 meters above sea level (approx. 6,000 feet). Natural Environment: Lower mountain cloud forest. High rainfall and humidity. Vegetation: trees, thorny shrubs, bamboos, palms, vines, bromeliads, orchids, tree-ferns. Large animals include jaguar, spectacled bear, spider monkey. Birds include toucans, turkeys and parakeets. Who were the Chachapoya? : An agriculturally-based, stone-building, metal-working culture that occupied the highlands and the cloud forests, or "ceja de la montaña" (eyebrow of the jungle), along the spine of the Andes, between the Marañón and Huallaga drainages, in North-Eastern Peru. They flourished for several centuries, probably acting as middle-men in the trade of items such as coca leaves and feathers between the lowland tribes and the coastal civilizations. They were overwhelmed by the Inca empire in the late 15th century. Always rebellious, they quickly allied themselves with Spanish conquistadores to throw off the Inca yoke, but they themselves soon fell victim to European epidemic diseases. Their population decimated, their culture disappeared entirely except for the ruins and artifacts they left behind. Archaeological research into the Chachapoya is scant. Scarcity of scientific information about them has unfortunately caused them to become the object of much speculation and fantasy  with unsubstantiated reports of vast Chachapoya metropolises, claims that the Chachapoya realm was El Dorado, and so forth. They have also been fictionalized in Clive Custlers novel "Inca Gold." Keith Muscutt, a British citizen resident in Santa Cruz, California, USA, was born in England and educated in England (Oundle School and University of Sussex) and the USA (Phillips Andover and UC Davis). He is the author/photographer of an illustrated book about the Chachapoya "Warriors of the Clouds: A Lost Civilization of the Upper Amazon of Peru." 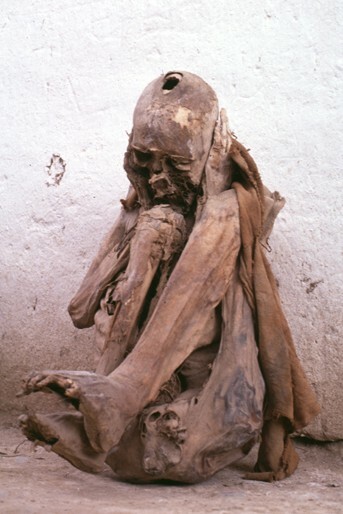 His expeditions to find, study and conserve ancient Chachapoya remains were the subject of a two-hour History Channel documentary "Cliff Mummies of the Andes." He has been exploring the upper Utcubamba, Pusac, Huabayacu, Huayabamba, Yonan, Huambo, Imaza, and Lejia drainages, in the Peruvian Departments of Amazonas, San Martín and La Libertad since 1981. Among the sites he was the first to document are: the walled citadel of Vira Vira; Pampa Hermosa; and the cliff tombs of Laguna Huayabamba, Cueva de Osiris, Casa de Oro, Brillante Luna, Tres Ojos, and Casa Blanca. He was a member of the official reconnaissance expedition that recorded the looted Chachapoya-Inca burial sites at the Lake of the Condors. Founder of an NGO, Fundacíon Benéfica Niños Pobres de Chuquibamba, he is Assistant Dean of the Arts at UC Santa Cruz, a member of the Institute for Andean Studies, and a Research Associate of the Museum of Man in San Diego. La penúltima foto no muestra La Penitenciaria pero Pirca Pirca. quisiera saber si Keith Muscutt tuvo Resolucion del INC de Peru para realizar este tipo de exploraciones y que Co Directo Peruano lo acompaño, de acuerdo a nuestra reglamentacion, es decir pagos de derecho de supervision y monitoreo. Es necesario conocewr el numero de la Autoricacion oficial del estado peruano.